Micheál Donoghue has urged Leinster Council to fix Galway's Walsh Cup final against Wexford at a neutral venue. 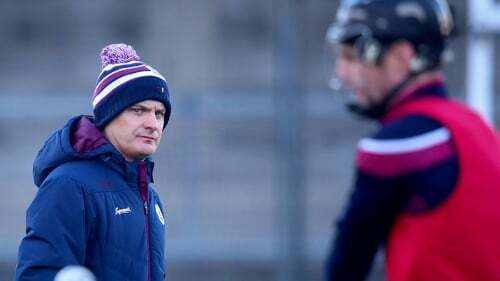 Joe Canning struck a brilliant winner from a sideline cut three minutes into stoppage time to squeeze the Tribesmen past Dublin in Parnell Park on Sunday and set up a meeting with Davy Fitzgerald's men, who beat Kilkenny in the other semi-final. Wexford, the holders, are slated to have home advantage for the decider but Donoghue could do without another considerable road trip, and called for a rethink in the wake of his team's victory. "We're after hearing that we've to go to Wexford," Donoghue told RTÉ Sport's Pauric Lodge. "Hopefully Leinster Council will look at that for us over the coming week because every team is at the same stage of preparation. It's a big commitment to expect us to go down to Wexford next Sunday." Last spring Galway travelled to Wexford in this competition only for the game to be postponed due to heavy snow. It was due to be played the next day but was called off again as the big freeze failed to let up. The frustration of that fruitless journey is doubtless fresh in Donoghue's mind but whether the Leinster Council relent and refix the game remains to be seen.